Thanksgiving is going to be cold. Really, really cold. A nasty front will be sliding south of the Washington region, pushed by arctic air that the NOAA says is the coldest of the season so far. 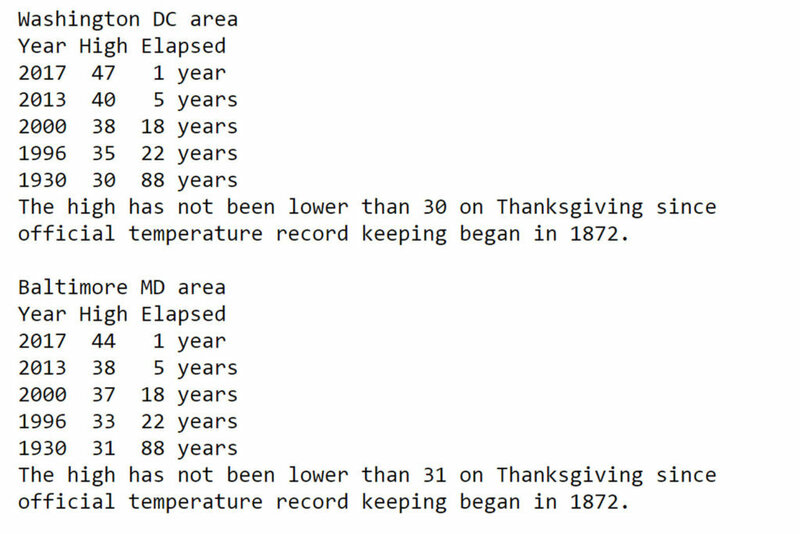 It could be the coldest Thanksgiving since 1996. WASHINGTON — Prepare to be thankful for fuzzy socks, warm sweaters and hot cider on Thanksgiving Day. 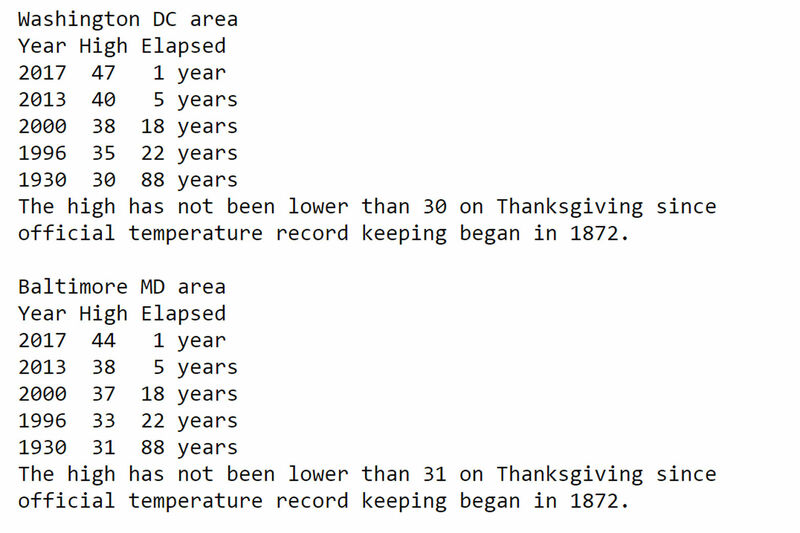 This year’s (cold) turkey day in the D.C. area could be the coldest one since 1996. 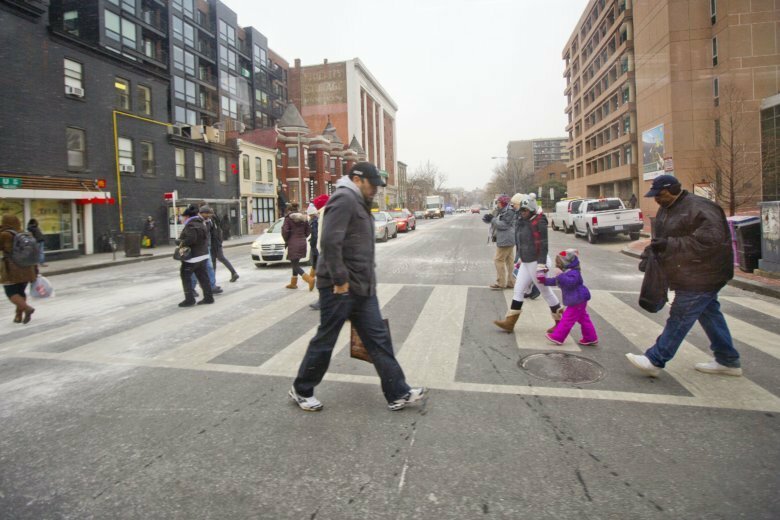 D.C. activated its Cold Emergency Plan on Wednesday, and it will be in place until 7 a.m. Friday. A Cold Emergency Alert will provide additional services and support to protect people from life-threatening illnesses and injuries associated with severe cold weather. Colder air will move across the region Wednesday night behind an arctic cold front from Canada. Thanksgiving Day will be much colder, with temperatures struggling to get above freezing and wind chills in the teens and 20s, says Storm Team 4 meteorologist Mike Stinneford. High temperatures will be in the 30s. At least it’ll be sunny and dry. The blast of cold will continue into Friday, though there will be lighter winds. High temperatures will reach the 40s. A large storm is poised to develop over the Great Plains Friday and could bring rain to the Washington metro Saturday afternoon. Saturday’s possible rain may first start out as sleet, but travel issues may only be brief as high temperatures reach the 50s. Of particular concern is the potential for a cold air damming situation west of the Blue Ridge, particularly over the Shenandoah Valley and central Virginia. A significant chance for wintry weather remains a concern. The D.C. area isn’t the only place bracing for a wintry sting. Two low-pressure systems should deliver light snow or rain showers from the Great Lakes into the Northeast. Record lows will be possible. The greater Northeast could wake up to temperatures in the teens or single digits — potentially above or below zero. It’s likely to be the coldest Turkey Day along the East Coast since 1996. WEDNESDAY: Mostly to partly sunny and breezy. HIGHS: 44 — 50. THANKSGIVING DAY: Sunny and very cold. Wind chills in the 20s all day. HIGHS: 30 — 35. FRIDAY: Mostly sunny but still cold. HIGHS: 35 — 40. ABC Radio contributed to this report.